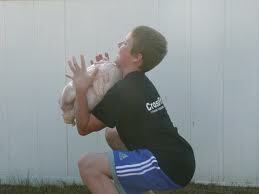 Thanks to CrossFit Kids for this great example of how to safely pick up our turkey this season…remember: “Fast Elbows” people!! First, I am SO GRATEFUL today for my wonderful CrossFit RX community. I feel very blessed on this Thanksgiving and hope you and yours are all doing well. Thanks again to those who showed up @ Stone Mountain bright and early to play today (you know who you are)…it was awesome! Just fyi (although it wasn’t for time officially) our first lap of the Cherokee Trail was just under 50 mintues, second lap just over. 2 Bike laps together in just over 50 min…and of course mucho transition time.